When Furniture Row Racing announced that they would cease operations Tuesday, my first reaction was shock. But as the news sunk in I realized that it should not have come as a surprise but rather another indication that NASCAR’s efforts to reduce the cost of operating a team at the premier Cup Series level are failing miserably. I won’t pretend that I have any answers. To say that NASCAR needs to cut costs is simplistic at best. What I do know is that the current system isn’t working and hasn’t been for some time. Fans aren’t attending races and we don’t need the track records to verify this. All we have to do is view the television broadcast on any given Sunday and it’s impossible to miss the empty seats. Television ratings are down and the only competitive teams are those that are funded by the owners with the deepest pockets. But as I pictured those empty seats I immediately thought about this past weekend at Darlington Raceway. I remembered standing outside and looking at the grandstands and realizing that they were packed with enthusiastic fans. So enthusiastic that when the threat of severe weather forced the track to announce that everyone should leave their seats and find shelter, hardly anyone moved. Those fans were not about to miss one minute of the upcoming Southern 500. Maybe Darlington has found at least some of the answers that have eluded NASCAR. Their throwback weekends have certainly been a success although it’s not a formula that would work anywhere else. But the ideals behind it just might. It may not address the main issue of cutting costs but it’s a place to start and a step in the right direction. What they do best is give fans what they want and it starts with tradition. Past winners include the men who laid the foundation for NASCAR, names like Cale Yarborough, Bobby Allison, Herb Thomas, David Pearson, Dale Earnhardt, and Bill Elliott, to name a few. And each year, Darlington continues to pay tribute to its storied history. 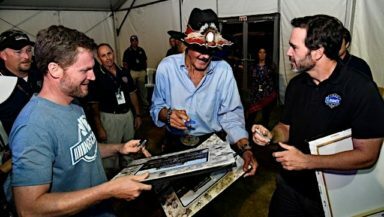 This weekend Richard Petty, one of NASCAR’s most iconic and influential ambassadors and winner of the 1967 Rebel 400 held court at the track. He was joined by others such as Jeff Burton, Ward Burton and Ricky Craven, all past winners at the “Track Too Tough to Tame.” Local dignitary, South Carolina Governor Henry McMaster, an ardent supporter of Darlington Raceway, was there as well. The track itself adds another distinctive element to the race’s appeal with its unique design, making it a standout among the newer cookie-cutter venues that are almost interchangeable. While adjusting the schedule to include a more diverse selection of tracks is not something that can be done overnight, it’s an issue that needs to be addressed, sooner rather than later. As for the next step, consider this tweet from Michael Waltrip, as he suggests a way to address risings costs. Waltrip’s idea may sound good in theory but it is also unfeasible. Although it’s impossible to turn back time, it is never a good idea to forget the past. It’s time to embrace what drew people to NASCAR in the first place – competitive racing, passionate drivers who aren’t afraid to speak their minds, a sense of community and tradition. Focus on the basics; the fans will come and the sponsors will follow. What steps should NASCAR take to get back on course? That is the million dollar question. Darlington is special. It is and always has been. The thinking to first move the Southern 500 from it’s traditional Labor Day Weekend was baffling to say the least. Darlington was the first speedway and that is special, a special that NASCAR seemed to have forgotten. Moving it back to this weekend was a great step in the right direction. I do agree that Darlington should have 2 races. With hardly no fans at Indy, extremely small crowds at Fontana as well as a number of other “cookie cutter 1.5 tri-oval” tracks hosting small crowds NASCAR needs to get back to it’s roots, it needs to bring back teens by offering affordable infield parking (back when I was in H.S. we used to go to both races at Rockingham, Charlotte, Darlington and Atlanta and we could afford it even back then) for it is the teens that are the next generation of fans and at current prices it is just completely un-affordable for them. I think the move to have the Supra, Mustang and Camero is smart. I’ve yet to see anyone get overly excited by a Ford Focus or a Toyota Camry (win on Sunday sell on Monday mind set) and just not relatable to high performance cars. Just my opinion. When the sport first started it was the Strictly Stock cars that raced. It dudn’t Take long for France to realize strictly stock cars were not up to grueling tests stock car racing out them thru. So most suspension parts were replaced with heavy duty parts. This did two things, one made the cars last longer and the other was they made the cars safer. Over the years the engines were made more durable along with clutches, transmissions etc. Generally speaking equipment failures are a thing of the past. All of these imorovements cost money. So saying getting back to stock is not necessarily a real good idea. However they go back to a stock body from the factory instead of custom building bodies like they do now. A metal hood is a lot cheaper then the carbon fiber they now use. Another cost saving would be to limit the number of cars a team can have. I’d say a super Speedway car, an intermediate track car and a short track car with a back up for each. That’s six cars total. Engine costs are rather tricky. Cutting costs there can backfire. Cutting costs for engine parts can cut reliability. The sport is in dire need of star power. They lost that when Earnhardt passed away. He had that rags to riches story that Americans love. His passion to win was without equal. It inspired the fans. Kyle Busch had a shot at it but decided it was better to act like a spoiled brat instead. Busch and Larsen are the only exciting drivers in the sport. All of this young talent that they have brought up are boring. They look alike and sound alike, Fans can’t relate to them. They appear to have no passion at all. The media has ordained Chase Elliott to be the most popular. why? He’s not an exciting driver and his interviews are mundane. As far as the tracks go most treat their races like ordinary events. Darlington has stepped up to the plate and tried to make the Southern 509 a special event again. And it is working. Whatever happened to marching bands, pre-race ceremonies that were entertaining, Beaty queens in victory lane, parade laps with dignitaries etc. Remember Miss Hurst Golden Shifter in the parade laps. Fans loved that stuff. One year Dover had a Corvette club bring a bunch of them for the parade laps. It was neat. They need to look at the old films and see what went in before the races and bring back some of those festivities. It’s time the tracks started to promote again. Bring back Humpy Wheeler. He knew the ropes. Racing is racing make chassis all the same and take away the simulators and all the high tec that only the RICH can afford and create a level playing field that we had in the early days and let the crews and drivers create the rest.